With the Extraordinary Pilots of San Diego Sky Tours, you will have the greatest airplane adventure of your life. Loops, Rolls, Barrel Rolls, and Hammerheads will be your moments over San Diego. WHO GETS TO DO THIS? Call our pilots now to Book! The Best Airplane Ride you can ever experience! This once-in-a-lifetime experience is for the adventure seekers. Make memories that are life changing! Besides aerobatics, this ride is the most comprehensive aerial tour of San Diego. Let one our current aerobatic specialists take you on a 'ride of your life' as you loop, roll, and zip your way across the San Diego skies. Pull and push +4.5 and -2 G's with speeds up to 152 mph in the Great Lakes open cockpit biplane. You can be one of the lucky few to experience its adrenalin-pumping capabilities up close and personal. Includes: a 20 minute briefing and 40-50 min flight (approx) from Montgomery Field. We call this an Aerobatic Adventure, an extraordinary and thrilling life time tour experience. 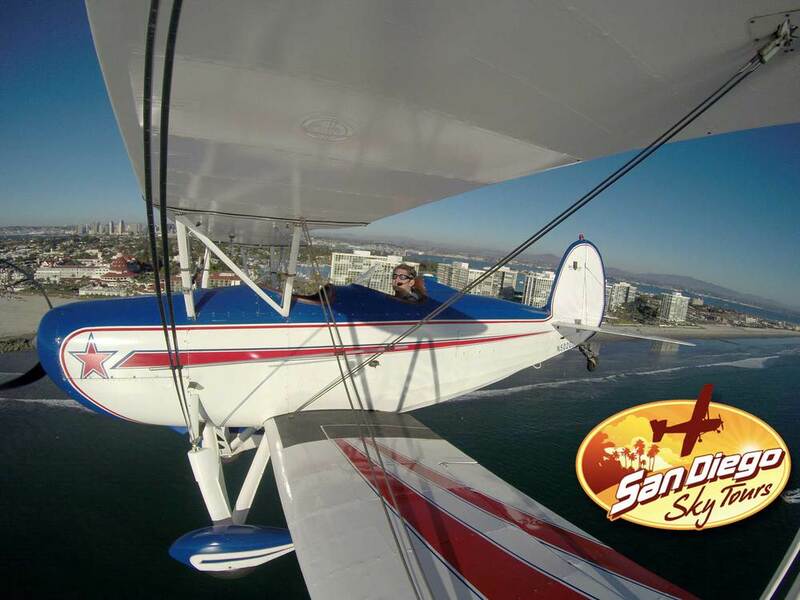 You will experience aerobatics (upside down flight, loops and rolls) and an unbelievable aerial tour of San Diego flying low level downtown and along the beaches. Just show up at the airport, meet with the pilot in the pilot lounge for an introduction and briefing, then fly the flight! Your friends and families can share your excitement with pictures or video as you embark on your adventure. Free drinks is available in our hangar. Availability: Based on pilot availability but usually 7 days a week and holidays. Feel free to give us a call or email us. Use the ‘Book Now’ feature to select your preferred date and times. GoPro Video: An In-flight GoPro video is available as an an add-on. Up to 4 different in-flight Camera's can be used. San Diego Sky Tours can also edit the video for a social media posting for an extra fee.